A profile of Ourgarage.co.uk was found on the social network Facebook. The web server used by Ourgarage.co.uk is run by The Positive Internet Company and is located in New York, USA. This web server runs 6 other websites, their language is mostly english. 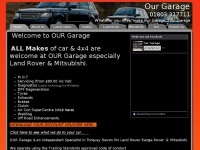 The websites of Ourgarage.co.uk are served by a Apache web server using the operating system Debian (Linux). The software used to serve the webpages was created by using the programming language PHP. XHTML 1.0 Transitional is used as markup language on the webpages. To analyze the visitors, the websites uses the analysis software Google Analytics. Indexing the data of the website and following hyperlinks on it is explicitly allowed by robot information. The visitors are redirected to the homepage of the website "/index.htm".